Meet Nixon, Tyrion, and Boss! 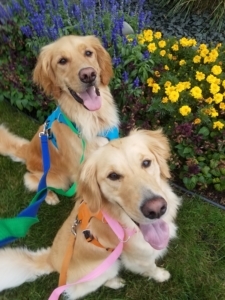 Golden retriever siblings Nixon and Tyrion have been playing at our Bloomington location for six months. Four-year-old Tyrion is everyone’s best friend. This gentle and nurturing boy is a social butterfly who loves playing big brother to nearly 3-year-old Nixon and all the young puppies at Wagging Tails. His owner Marche tells us that Tyrion also loves horses and remains glued to the television anytime he sees one. He recently met one in real life and was so excited, it was as though he was meeting his hero! Younger brother Nixon loves to snuggle and give kisses. He’s absolutely devoted to his family and even picked them the day they went to meet his litter. After marching right up to his dad, he crawled into his lap, and lay down. The family knew then and there that Nixon was the dog for them! At Wagging Tails, Nixon loves playing in the water during Pool Days and will go for a swim any chance he gets. Marche says Nixon is still a puppy at heart and loves to play fetch. And while he loves everyone, his best friend is his big brother and biological half-brother Tyrion. Boss is a loving two-year-old pit bull living in Eagan who’s been coming to Wagging Tails since he was a puppy. During his doggy daycare “Playday” visits, Boss loves playing all day and considers everyone has buddy. After a long day of playing, Boss loves to come home to sunbathe. His owners Louie and Julie tell us that Boss will search out the even smallest spot of sunlight before laying down. And, once he finds it, Boss follows it as the sun moves across the sky until it finally disappears. 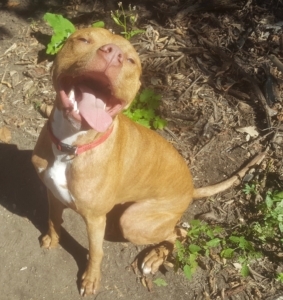 Boss is such an even keel dog his owners often wonder if he’s part human — especially when he shares his huge pitty smile. They also say he’s an incredibly loyal and super smart boy who loves their whole family unconditionally.